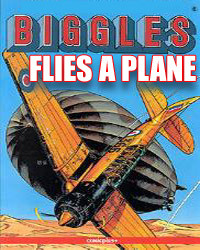 Low on fuel, Biggles ejaculates over the USA in his 1971 self-penned biography, detailing how he developed his infamous one handed piloting technique. Biggles, known as the Big White Fokker, was a popular British hero through the troubled times of the 20th century. 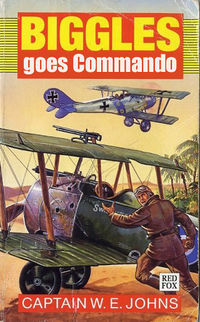 With his erstwhile friend and sometime lover Ginger “Ginger” Gingerstone, Biggles fought in two world wars and participated in numerous minor skirmishes. Born in Lower Wangton, Essex, as Norris Odysseus Bigglesworth, he became a noted Wicket Keeper with the Wangton Cricket XI, with excellent ball handling skills. It is often suggested that but for the outbreak of war, Biggles may have found fame with his quick hands, stroking balls across wickets and stumps the length and breadth of England. Little is known of his early childhood, his father Charles Behemoth Bigglesworth was a Quantity Surveyor from Wigan, Lancashire, whilst his mother Deidre "Mumsy" Quimbury of London worked in Haberdashery. Her death in 1927 had a lasting effect on the young Biggles. 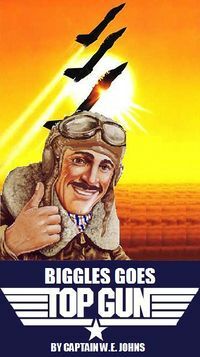 For those without comedic tastes, the so-called experts at Wikipedia think they have an article about Biggles. Aged just 16 (he lied on his sign up papers) at the start of the Great War, Biggles signed up as a RAF cadet. Through luck he managed to be stationed for training under the world famous pilot Wing Commander Monty Python. 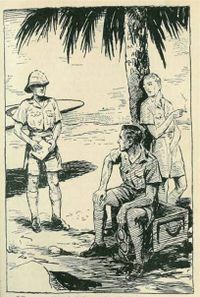 The two became firm friends, and it was in no time at all that Biggles found himself sitting in the Officer’s Mess. Flying his trusty Sopwith Pup, Biggles soon began to make a name for himself, giving the Huns a spanking they wouldn’t soon forget. He quickly became a target of famed German Ace Manfred von Mann, known as the Rod Baron, who desperately wanted to get his hands and other body parts on the young Biggles, but it wasn’t until 1917 that the two were to meet. The dogfight between these two has since become the stuff of legend, with witnesses describing each man’s efforts to twist and turn before offloading their weapon at the other combatant. The need to refuel after both pilots spent their payload, left the encounter with no clear outcome. He ended the war with the rank of Squadron Leader in the 266 Squadron RFC (Royal Flying Corpse). The end of the war brought a period of introspection for Biggles, who received the George Cross for his services. With an end to hostilities, Biggles sought out a substitute for the natural high that can only be achieved by killing Germans. A shrapnel wound to the groin prevented a return to his beloved cricket, and so Biggles found work with his friend Monty Python, and his new business venture his Fliegender Zirkus. He remained with Monty until the unfortunate death of his friend, who was crushed whilst flying under a giant suspended foot. Despite being a hardened member of the team, Biggles would turn his back on flying for the next three years. Biggles turned to alcohol, and it took the gentle probings of pals Ginger and Algy to get him back on track. each hand, and wrestled them to the ground, but was taken by surprise from behind. Forever chasing the tails of the strong-jawed German pilots, Biggles was always willing to get down and dirty to get his man. Biggles was recalled to active service during December 1939, and whilst he took a while to be persuaded to upgrade his trusty Sopwith Pup for a Spitfire, his kill rate remained impressive. By 1941 he had personally downed over 500 Germans. By the close of the war that figure would approach 900. His reputation as a Flying Ace would be assured. In 1942 Biggles was awarded both the Victoria Cross and the HMRFRA for valour, when, despite losing a foot, he returned to active duty. It would be a scar he would carry with him for the rest of his life. One battle during 1943 nearly saw Biggles come to a sticky end, as he found himself alone over western Germany outnumbered 7 to 1. Caught with his pants down, Biggles could only mount a rearguard action, ejaculating out of his plane, deep into enemy territory. Disguised as a Belgian whore, Biggles spent the next 6 months hopping across Europe. It is thought that it was during this time he amassed his personal fortune. In June 1945, Biggles was captured during a daring undercover mission, and incarcerated in Colditz for the next 6 years, during which time he completed four autobiographies and killed sixteen Germans. For him, the war was over. The years immediately after the war saw a quieter more thoughtful Biggles, who took to a more peaceful life. He did manage to continue killing Germans well into the early 1960s, but his fans within the police department were able to have these deaths ruled "accidental". At the end of his life he had clocked up a kill rate of 1024 (1002 Germans, 8 Italians, 13 French Nationals and an Aardvark). But for failing health he might have been able to reach a greater figure. 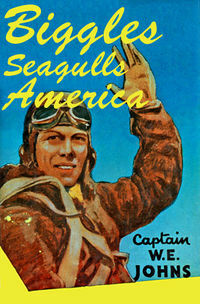 Between the end of the war and his death, Biggles concentrated on his writing, his autobiographical series, published under his pseudonym of W.E.Johns. He also wrote a number of books on the effects of Quantity Surveying on the nocturnal habits of the genus Orycteropus. Biggles, the Great British Hero, passed away quietly at his home in Buckinghamshire on September 29th 1978. A national day of mourning was held, and the following year on the anniversary of his death a monument was erected in his honour, staring out over the Embankment where he had spent so many evenings, with his fist raised in a silent salute. Following that, the RAF flew an aerial salute in honour of him using Sopwith Camels. Unfortunately, the planes malfunctioned and crashed into the Thames. It was the worst air disaster in British History. The result was 100 airmen killed. Look at the size of that Fokker! This page was last edited on 26 October 2014, at 01:32.